CHICAGO – Tish Hayes, Terra B. Jacobson and Troy A. Swanson, all of the Moraine Valley Community College (MVCC) Library (Palos Hills, Ill.), have been named the 2014 recipients of the Association of College and Research Libraries (ACRL) College Libraries Section (CLS) ProQuest Innovation in College Librarianship Award for their work on the “One Book, One College” program. 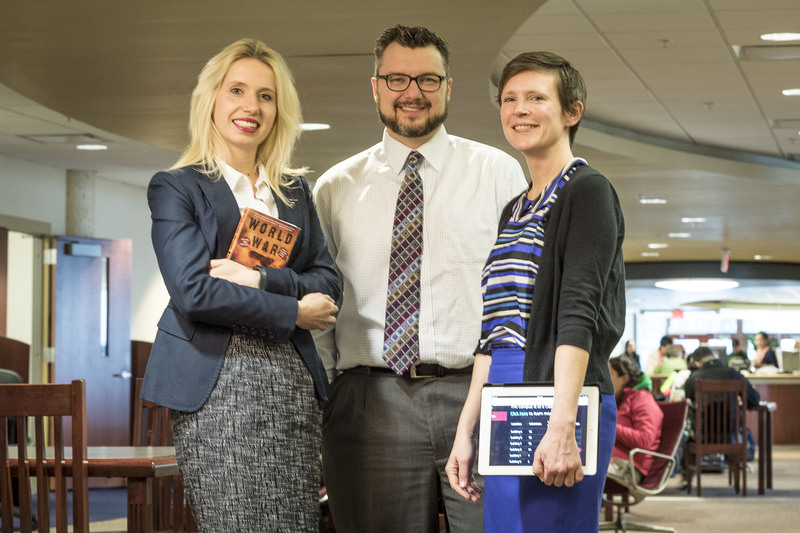 Hayes is information literacy librarian, Jacobson is manager of library services and Swanson is department chair of library services at MVCC. This annual award honors ALA members who have demonstrated a capacity for innovation in their work with undergraduates, instructors and/or the library community. ProQuest will present the $3,000 award and plaque during the CLS program at the 2014 ALA Annual Conference in Las Vegas. Every year the Moraine Valley Community College Library sponsors the “One Book, One College” project, which includes panels and lectures by faculty, resources and study guides for the book and related themes, videos and podcasts. The 2013-14 selection, “World War Z” by Max Brooks, an oral history of a zombie apocalypse, provided a unique opportunity to engage the campus in a large-scale active learning event. This event required coordination across a wide-range of departments including the Student Activities, IT, Marketing, campus police and faculty. This cooperation and support across campus, along with the opportunity to engage students with a unique learning event, makes this a truly innovative project. Hayes received her MLIS from Dominican University. Jacobson received her BA from Augustana College and MLS and MIS from Indiana University. Swanson received his BA in history and political science from Augustana College, his MLIS from Dominican University and his PhD in community college leadership from Old Dominion University. For more information regarding the ACRL CLS ProQuest Innovation in College Librarianship Award, or a complete list of past recipients, please visit the awards section of the ACRL website. The Association of College & Research Libraries (ACRL) is the higher education association for librarians. Representing more than 11,500 academic and research librarians and interested individuals, ACRL (a division of the American Library Association) is the only individual membership organization in North America that develops programs, products and services to help academic and research librarians learn, innovate and lead within the academic community. Founded in 1940, ACRL is committed to advancing learning and transforming scholarship. ACRL is on the Web at www.acrl.org/, Facebook at www.facebook.com/ala.acrl and Twitter at @ala_acrl.